From a ringside seat, we report back on the experience of the latest Nintendo sporting event. 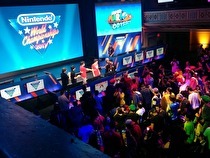 Last weekend, Nintendo held their second modern stab at the Nintendo World Championships in New York City. Some of the staff were on hand to watch it live and after a fun evening of excitement, laughs, and taking pictures for the site Twitter while leaning over a balcony, I’m here to lay out some of the neat things I took away from my first-ever live viewing of an eSports event (however weird and offbeat Nintendo does it).